Kyle Headstream submitted this photo and caption. 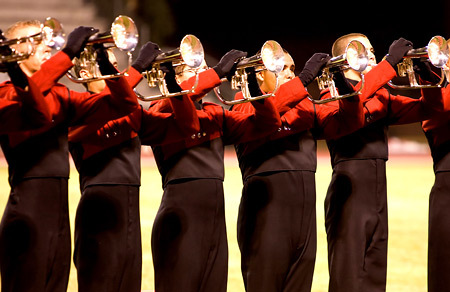 This is a photo of the 2008 Academy flugelhorn section. On the far left is my good friend Dan Fischer, who joined the Academy in 2005 as part of the corps' first flugelhorn line and aged out in 2008 as part of the last. Following him is Kyle LaCasse, Max Wilson, Jon Garcia, and me. It was a great summer, and I wouldn't trade my experience with these guys for anything.